"A top listing in search results has absoultely nothing to do with software price, quality or service." Listen! The first clue as to which software will cost the most and likely have the most adverse usage policies are the ones listed highest in paid ads. Also note that the position of the ads change, often because this form of advertising is expensive and one by one vendors feel the pain and reduce their bids or withdraw them altogether. THEIR CUSTOMERS ARE PAYING FOR THOSE ADS!! With a lot of work you could visit each and every website and if it were possible to gather all first-year and long-term costs, you could prove for yourself that vendors appearing at the top of search results are passing the cost of advertising on to their software customers with higher prices and hidden fees. 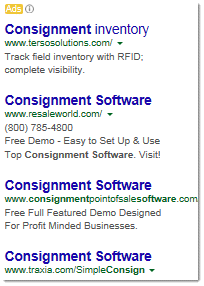 Best Consignment Shop Software does not pay for ads and so it has the best prices. Rico and Traxia are web-based plans. The monthly payment never stops. Great revenue stream for them and a terrible option for consignment stores (not to mention having your customers' information stored on a hackable computer over which you have no control). All but Best Consignment Shop Software charge annual service fees, which leaves the door widen open for future increases in fees. Actually, to be accurate, the 5-year cost of BCSS would be $1391 minus the resale value of the program (about $500). None of the other programs have 'resale value'. The folks at softwareadvice dot com don't sell software. They pay for their top position in the search engines then allegedly advise their website visitors on which software program is best for them. You guessed it: They only recommend the highest-priced programs and will NOT mention Best Consignment Shop Software BECAUSE BCSS refuses to pay them for recommendations! The advice at softwareadvice dot com is NOT unbiased. It is a paid opinion. It should come as no surprise that competitors of Best Consignment Shop Software frequently infringe on the name 'Best Consignment Shop Software' - in most cases the same high-priced over-priced vendors out to rake consignment shops for all they can get. *Based on 5 computers in use - necessary because increasing the annual service fee based upon the number of computers in use is just one way vendors hide added costs after purchase. These figures are based upon current website information. History suggests that the annual service fee will be increased frequently and considerably. Send an Email or call me at 606-789-1661.